The Witty Ways of a Wayward Woman: Catastrophe! Oh God. I have bad news, dear readers. I know, I know, it's not exactly global apocalyptic news. But it's catastrophic news for me. I shall now have to wear one of the *ucking awful rubber caps in the pool this week. 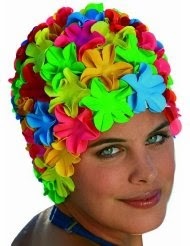 Picture courtesy of Amazon where they also sell a number of other more discreet swimming caps. That is one funky hat. I'm thinking 1950's, Hollywood starlets, 'Mad Men' ... Anything Kim Kardashian wouldn't be seen in is fine with me. Am I sounding old? No, don't answer that!